As 2018 winds to a close, it's time to take a moment to reflect on the year and all of the truly incredible offerings the year had when it comes to comics. This year, the team here at ComicBook.com came together to honor not just our favorite comic series from the past year, but those deemed to be the best of the best for our Golden Issue Awards. As you might guess, choosing a winner was no easy task. 2018 was truly an excellent year for readers of ongoing comic series, giving fans more than a few incredible series to indulge in this year. Naturally, when the books are this good, the real winners are the fans, but we can only give out one award; that's just how these things work. Batman by Tom King, Joelle Jones, Clay Mann, Lee Weeks, Mikel Janin, and Tony S. Daniel! For the second year in a row, Batman takes home the Golden Issue Award, and if you've been following along with the series it's easy to see why. While last year we praised writer Tom King for consistently finding a balance with Batman's flaws and brooding, this year it's how King has embraced them by giving readers a darker, more brooding, and more deeply shattered Batman than we've ever seen. His depiction of a Batman so devastated that he's unrecognizable to himself as well as readers makes for a deeply satisfying -- if not brutally uncomfortable -- read as the iconic character slips further and further away from his humanity. 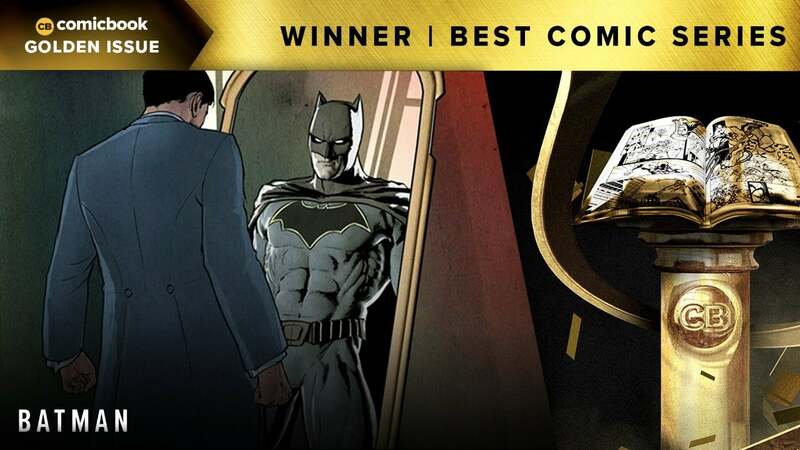 But it's not just the depth of Batman's darkness that earns the series its award. King's Batman is not dark for darkness' sake but has suffered real loss and heartbreak in 2018. The landmark issue #50 was supposed to have been the grand wedding of Bruce Wayne and Selina Kyle, but after the exquisite blossoming of their relationship in 2017, it's a wedding that never happens. While having Selina leave Bruce at the proverbial altar was a controversial choice that fans are still talking about months later, it was also the spark this fresh, vulnerable Batman readers are getting to know. The "Cold Days" arc in particular may be one of the most raw and unguarded we've ever seen Bruce Wayne -- something that have influence on the character for years and years to come. And this year's Batman would be nothing without the incredible art of Joelle Jones, Clay Mann, Lee Weeks, Mikel Janin, and Tony S. Daniel bringing the emotion, the pain, and even the hope of every page to life. In sum, Batman was simply extraordinary in 2018, and we can't wait to see where 2019 goes.